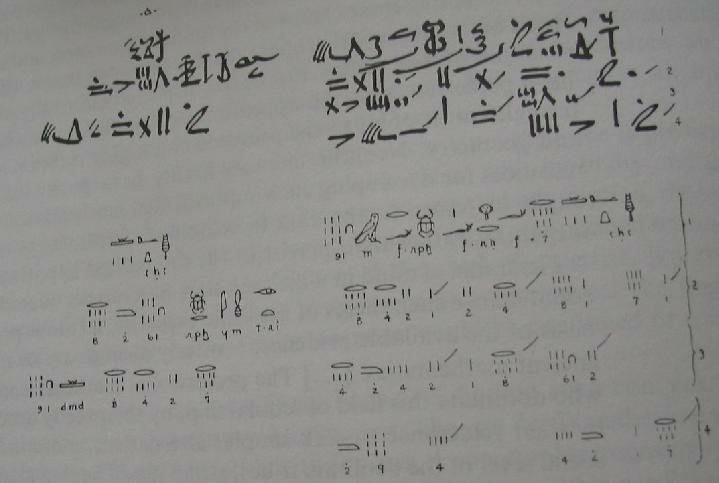 The Rhind Mathematical Papyrus [Midonick, pp. 706-732, Fauvel, pp. 14-16] is the largest among the existing Egyptian papyri. It's named after the British archeologist A. Henry Rhind who purchased it in 1858. It was acquired by the British Museum in 1864 from Rhind's estate and made available in facsimile form to scholars of mathematics and Egyptology. Originally it came in two parts of a single scroll. The missing (middle) part was discovered in 1922 among a private papyri collection in New York. The Rhind Papyrus which is dated circa 1650 B.C. contains some problems that are found in an ealier Moscow Papyrus dating from 1850 B.C. Much of the Rhind Papyrus deals with proportional reasoning and multiplication by doubling. I'll give a couple of examples based on [Midonick]. Divide 7 loaves among 10 men. Each man receives 2/3 1/30. Total of 7 loaves, which is correct. The foregoing example must be taken with a grain of salt. Written in the modern notations, it conveys the spirit of the procedure. In particular, it is noteworthy that multiplication by 10 has been carried out by repeated doubling and addition, which links it to the Russian Peasant Multiplication algorithm. A quantity and its 1/7 added together become 19. What is the quantity? As many times as 8 must be multiplied to give 19, so many times 7 must be multiplied to give the required number. You may want to compare this to a modern day solution.